Try Rowing with U.P. Rowing! Every year in June U.P. 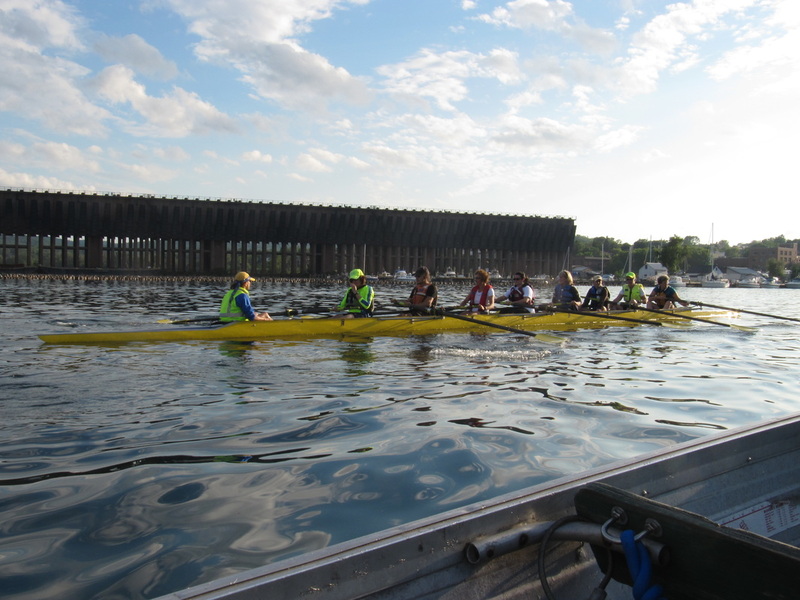 Rowing hosts its annual ﻿Learn to Row﻿ program for those interested in learning how to row. There are classes for adults and youth. If you are interested in participating in this year's program, please see our Calendar of Events page and join us at our no-obligation Informational Meeting (you can even print your Membership Packet ahead of time!). Membership Packets will also be available at the Informational meeting. If you have previous rowing experience please contact us, or join us for our Informational Meeting, and our required Orientation day. 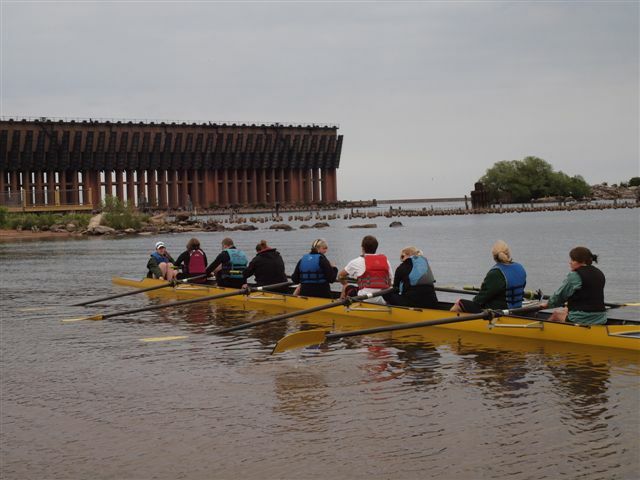 We have many opportunities for you to row, whether you are new to rowing, or have previous experience. All our coaches are Level II certified, and equipment is provided for you. All you have to do is provide your own PFD (life jacket). Off-season erg training is also offered in the wintertime. Please contact us if you are interested. ADULT LEARN TO ROW CLASS (single) $200. Includes first year membership and free T shirt. ADULT LEARN TO ROW CLASS (family of 2) $360. Includes first year membership and 2 free T shirts. ADULT ROWER (Prior rowing experience) $200. ADULT COUPLE (Prior rowing experience) $360. COXSWAIN (We will train) What the heck is a coxswain? Click here to find out. There is special pricing available for those unique individuals who are small in stature, and who like bossing people around. Learn to Row format: How do I get started? What can I expect? We are very proud to be able to offer youth rowing in our community. Rowing is as much an individual sport as it is a team sport. It fosters discipline, teamwork, concentration, and commitment. Many of our youth have gone on to the collegiate level, and one of our former youth rowers has even advanced to represent the U.S. in the 2015 Summer World University Games, Gwangju, South Korea. Athletes, and non-athletes alike are encouraged to try rowing. It is a great cross-training platform for many sports including basketball, volleyball, and swimming. Additionally, many high-schoolers who have never found the right high-school sport for them, have found their sport in rowing. Swim test (treading water for 5 min., then don a PDF (lifejacket) while still in the water, remove PFD and then swim 50 yards (any stroke) without touching bottom. This is done with shorts and a t-shirt (no bathing suite), so please remember to bring a towel and change of clothing. Rowing is a sport with a dramatic learning curve, and we want you to get the most out of the class. Because each session builds upon the last, attendance of 80% or higher is strongly recommended. 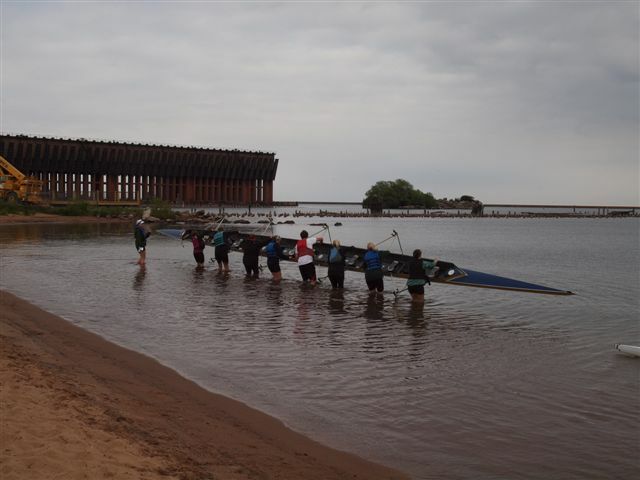 ﻿If you have little, or no rowing experience, our Learn to Row program could be for you. As you consider joining us for the Adult Learn to Row class this year, we do highly recommend joining us for our Informational Meeting. Here is where we introduce ourselves, explain what we do, show you a slideshow, and explain our Learn to Row class format. We will be happy to answer any questions you may have about our program. Once the above requirements are completed, your next step will be to attend one of two Saturday sessions (June 8 or 15) from 9:00am-1:00pm. Here is where you will learn everything you ever wanted to know about rowing...and more. You'll probably forget more than you'll remember, but don't worry! We will be building on this foundation every day. It is imperative you attend the Saturday session because so much information is presented in this session that it is impossible for us to offer a makeup session. And you will need this foundation in order to continue with the weekday classes. You will be learning in an 8-person sweep boat (sweep rowing means each person has one oar--sculling uses two oars per person). After your Saturday session, you will continue twice a week with 1.5 hour coached classes (Tuesdays and Thursdays 8:00-9:30am; or Tuesdays and Thursdays 5:30-7:00pm) until the end of July. After that you are considered a graduate! Then you may sign up for additional sessions via our online polling system. During these sessions, there will always be one or more experienced members in attendance to help assist, and some additional coaching is possible. Rowing is a sport with a dramatic learning curve, so attendance for the first Saturday class is essential. We want you to get the most out of the class, and because each session builds upon the last, attendance of 80% or higher is strongly recommended. The CRP exists for the improvement of technique and fitness for masters rowers with two or more years of experience. 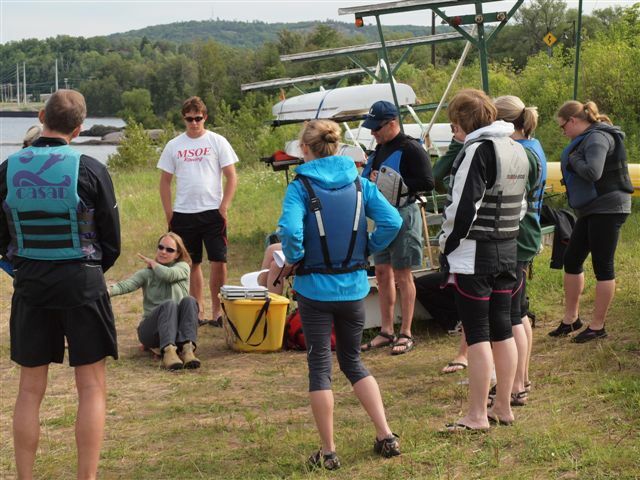 USRowing certified coaches, along with key volunteers, will provide regular training to prepare athletes to compete locally and nationally. 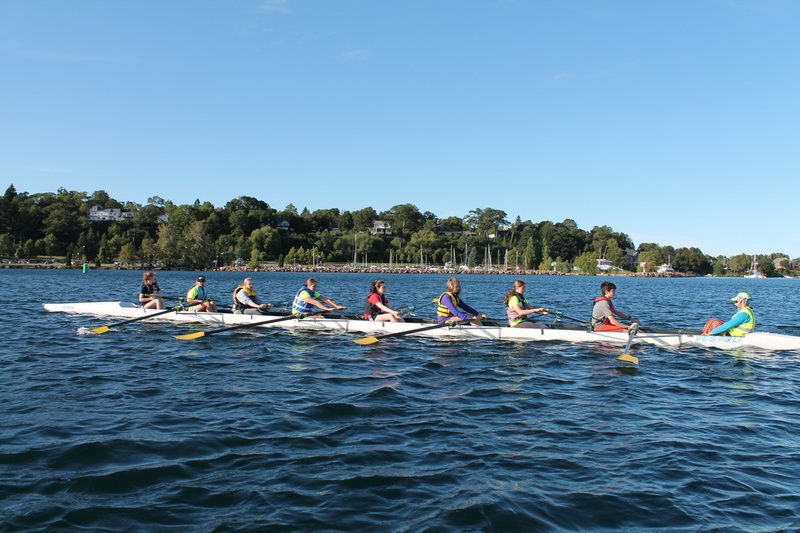 Training includes off-season erg training (January-October), and on-water coaching and evaluation (June-October). Athletes will need to pass an erg test, and an on-water technique evaluation with observance from a coach before being considered for the Competitive program. U.S. Rowing Level II Coaches: Debi Cook, Helen Crowe, Daryl Davis, Ginny Davis, Sally Davis, Deb Jean, Sue Lakanen, Tensi Parsons, Ann Piereson, Simone Vajda, and Sue Vandewalle. 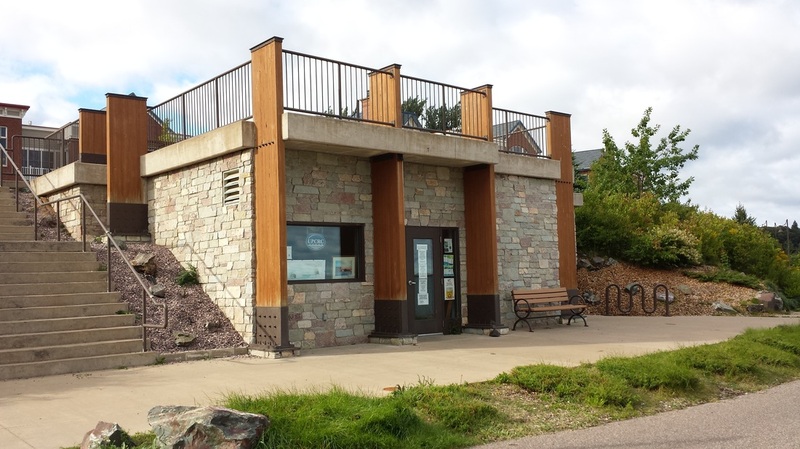 Certified Erg Coaches: Lynn Baldwin, Deb Jean, Tensi Parsons, Ann Piereson, Simone Vajda, and Susan Vandewalle.